Today the word “education” encompasses a whole lot more than just schooling and academic learning. Great value is placed upon extra-curricular activities and that’s not a bad thing. I’m all for encouraging kids to explore other interests; a bit of sport, music, drama, gardening..whatever floats their boat really. But have we gone too far in our quest to broaden our children’s horizons? Are we overloading them and trying too hard to produce over accomplished little prodigies? I can’t help but think that we are in the midst of an extra-curricular club frenzy. Firstly, there seems to be this underlying presumption that the more clubs your child attends, the better parent you are perceived to be. It demonstrates that you are an “active parent” who is willing to ferry your kids around to a million different clubs all week whilst grabbing a latte and babyccino en route. The peer pressure to participate in this ritual is acute as nobody wants to be perceived as lazy or disinterested. 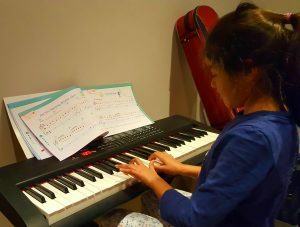 There is also the underlying fear that whilst your kids are at home watching Catchup TV or playing with My Little Pony, other children will, in the meantime, be developing superhuman talents that far outweigh the talents of your own children. 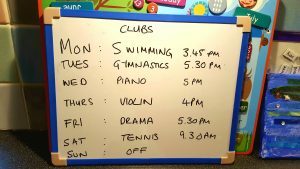 So you feel compelled to join in with this club frenzy as you don’t want to deprive your child of the opportunity to become the next mini Mozart or leading gymnast, do you? The pressure to keep up is very real. Enrolling your child into every single possible club is also, almost certainly, a status symbol for some parents. It’s a very visible sign of disposable income, bearing in mind some of these activities are NOT cheap at all. It’s a case of keeping up with the Jones’ and ensuring your child doesn’t miss out on what the child next door is doing. It’s about projecting a certain image of your life. And don’t get me started on the various different “squads” that exist at school. There’s swim squad, gym squad, tennis squad, the A team for cricket, the A team for football etc. The list is endless. These squads are ‘by invitation only’ which basically leaves those kids that aren’t invited (and their parents) feeling like rejects. Whilst I understand the importance of developing and nurturing talent in these squads, it seems a bit unfortunate that it is done at such a young age (at five or six) and that kids are categorised as being either “sporty” or “unsporty” at such an early stage of their lives. There is also the very real concern that we are overloading our kids with activities. Some children attend clubs every single day after school and at the weekend. Whilst they might enjoy it initially, at some point they WILL flip out and have the mother of all meltdowns, quite possibly in public, driven primarily by exhaustion. Or worse, they may internalise it and become anxious and stressed out. Kids unequivocally need down time. In my experience, they need to recharge their batteries and switch off from the daily grind. They need to enjoy moments of peace and quiet. There is this false notion that children have to be entertained every moment of every day. That their days must be filled with activity. How about allowing them to be still or even bored? They might surprise you with their creativity and imagination. Being able to manage their own time and create their own sense of enjoyment is also a critical life skill. We all want well rounded children and extra-curricular activities clearly help promote that. But we have to think about whose needs we are really meeting. Are we sending our kids to a hundred thousand different clubs to enrich their lives or to fulfil our own ambitions and hopes? No parent wants to deprive their kids of opportunities but I wonder if overscheduling deprives them of a free and unburdened childhood? The end goal for all of us is to provide a happy and nurturing childhood and surely the key to that is balance? Kids need stimulation for sure, but they also need space to just be. Previous Post“Mummy, why is my skin this colour?”Next PostWhy didn’t I take my husband’s name? They definitively need space to just be. The free clubs after school are the real deal, puppet making? Hello, I want to be a kid again! Wow!!! !Flump does seem to be doing a lot of clubs….loved your article and agree too many clubs are not something that is required…but in nowadays world it gets necessary to keep them busy…so that as they grow up few of these things will keep busy and entertained rather than getting involved in wrong stuff…. What an excellent way to sum this issue up. Some people feel it is so necessary to fill every bit of their child’s free time with clubs when all they need is some time to actually be a child not a mini robot. Have had to resist feeling guilty that K is not in the merry-go-round of school club attendance. In my opinion they need their lunch breaks for being outside as much as possible . Also weekends she is tired (and I mean exhausted ) so shelling out for activities seems wasteful. Hence, no guilt!